So…yeah. Another month [nearly] gone and only a lone entry thus far to mark it’s passage. That’s just sad. I’ve been meaning to write an entry for like two weeks now but it never seems like I have the time. Plus, summers are dull in Florida; all the locals hibernate from the sweltering heat and humidity and we get lethargic and don’t do anything. Feels like it’s just the same old, same old most days and who really wants to read about that? I will say though that for those of you not on my facebook, we have decided for sure to keep little Ginger. She’s the orange kitten my Mom found on the side of a busy road in a canal back at the end of May. She was about 7-8 weeks old at the time and we were originally going to just foster her until she was done with her medications for internal parasites. But, being an adorable orange kitten, I fell in love and couldn’t bear giving her up. And thus, third cat in the home. 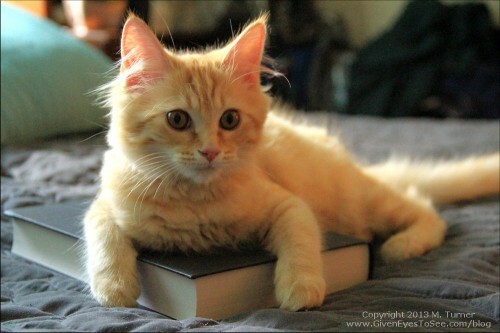 Ginger says books are wonderful! Well, for laying on anyway. She’ll be about 4 months the beginning of August and time to get her spayed and get her kitten shots. I set up a GoFundMe for Ginger Spay & Shots campaign to help with the next set of medical bills. We reached our initial goal but I’m leaving the campaign open simply because kitties are expensive and there’s always more costs then you estimate going in. Any donations will go towards Ginger and her vet care. 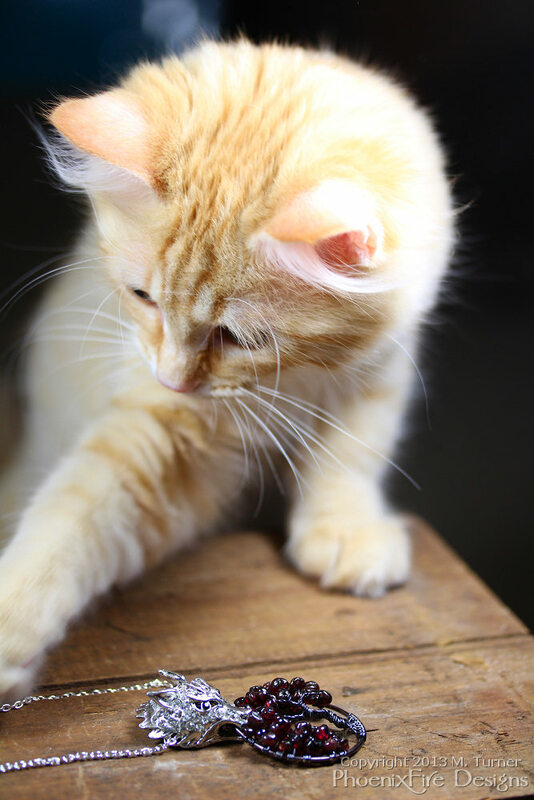 Ginger is a very diligent photographer’s assistant, ensuring the jewelry is placed *just so* for the shot. Been working extra hard trying to drum up sales and attention to my shop these past couple months as the summer retail slowdown has definitely hit. Between the kitten and some other unplanned expenses, we’ve been really tight on cash, having gone through our entire emergency savings (not that it was much) a couple months back and have been struggling with the paycheck-to-paycheck and sale-to-sale survival mode as a result. It makes for a lot of stress and being stressed out about money is never a fun thing to dwell on. Speaking of the shop, here’s a look at the newest items at PhoenixFire Designs. A lot of these are new styles and designs. I’ve been trying to – warning, bad pun ahead – branch out (see? told ya) a bit in offering some new types of trees. Click any image for more info. Love’s car also needs new CV joints (at a cost of about $500 for both) and the damned car is pretty much undrivable at this point as it shakes violently between 50-60mph or so and it feels like the entire car is going to shudder apart. It’s awful. And, with the whole short-on-funds state we’ve been in lately, I have less then half of that free on my credit card at the moment so we’re having to just grin and bear it and hope it doesn’t get worse or cause more problems before we can save up enough money to get it fixed. It’s another reason why I so desperately needed to set up Ginger’s fund because I NEED to save the available credit on the credit card for the car, not her surgery. July has also been a sad month family-wise. My Mom’s Godfather (her Dad’s younger brother; my great uncle) passed away. Love’s great aunt (his grandfather’s younger sister) just died and we were at her funeral yesterday. And my great aunt is waiting on a second opinion to hear about her lung-cancer-turned-liver-cancer to see if there is anything that can be done. Add to all of that the fact that Tuesday, July 30th would have been Rand’s 46th birthday. It’s just been a bit of a downer month and a lot of things haven’t helped. I really can’t wait for summer to be over and get on with the rest of the year. I want my business to pick up again seasonally like it does, to get ahead again on the bills (not just barely scraping by wondering where each payment is going to come from and being maxed out on my credit card because I can’t afford to pay it back down) and just have the miserable weather and such too behind us. I’m ready to fast-forward a few months and get into a better place. Anyway, a lot of this down feeling is also why it’s been hard to blog. I don’t really want to be all “gloom and doom” because it’s not like it’s the end of the world, just a frustrating period. I know we’ll get through it but in the short-term, it’s just a lot of constant, daily stress and that wears on you. And that was July. Sorta. Close enough anyway. Maybe I’ll manage to get another entry before another month goes by but who knows? Me too. 🙂 Her cuteness is epic. Comments are closed. Would you like to contact the author directly?